A few months ago we had the opportunity to review and share with you our thoughts on the movie, Turbo. We loved it and was super happy to hear that Netflix picked up the show to be their first ever original series for kids called, Turbo Fast. This cartoon has been a hit in my house with my little ones. They enjoy each episode and are excited that there are more new episodes that have recently been added. This way they get to enjoy their favorite characters from the show in a new fast adventure per episode. My son's favorite character is Turbo and my daughter loves Skidmark. I love that they both have a show that they both love and can watch together. 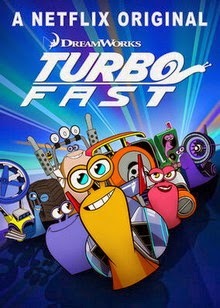 “Turbo FAST” is an outrageous, high-octane ensemble comedy series teaming the world-famous super-powered snail Turbo (Reid Scott) with his posse of adrenaline-junkie buddies to form the Fast Action Stunt Team (FAST). Together, they amp up everything to the extreme: extreme adventure, extreme challenges and extreme excitement. Each member of the Stunt Team – Turbo (Reid Scott), Whiplash (John Eric Bentley), Burn (Grey DeLisle-Griffin), Smoove Move (Phil Lamarr), White Shadow (Michael Patrick Bell), Skidmark (Amir Talai) and Turbo’s brother and team medic, Chet (Eric Bauza)– has their own customized shell and catch phrase (Ya dig?). I am excited to offer a Turbo prize pack (Turbo Swag, Popcorn & more) & 6 month Netflix Subscription to one of our Canadian Readers! Be sure to leave a comment letting us know which character in the Turbo Fast series is you and/or your kids favorite!